This is a monumental work in the field of historical journalism.Mr. Shirer graduated from college and took a cattle transport to Europe to spend the summer sight-seeing.Fifteen years later, he was chased out by the Gestapo who were planning to nab him on a trumped up charge of espionage.In between those two moments he witnessedfirst hand the fall of the old European states France and England, and the emergence of Adolf Hitler and the Third Reich. Shirer taps into the Hegelian historical model of the superman, or the individual, who through the force of his own personality and will, shape the course of world history for better or worse. Indeed the mid-twentieth century was perhaps the crowning moment of such a feature in world history, with such dynamic and driven personalities such as Hitler, Roosevelt, Stalin, Churchill testing their abilities to lead their nations against each other.And the vacuum of such leaddership in France highlights the Hegelian model as France disappears from the stage in the first months of the war and does not return. This is not a book about World War II, however.It is a book about the Third Reich.The only details of the war in the pacific that emerge in the book are those relevant to events in the European theater.The book also focuses on the years leading up to World War II, rather than the events of the war itself.Shirer illustrates a pattern of behavior within the inner circle of the Third Reich and shows how that pattern was responsible for both the rapid rise of Nazi Germany and its downfall.It is a pattern of grim determination, ruthless paranoia, historical distortion and shrewd exploitation of the media to always blame its victims for the wars they start. Once the pattern is adequately defined and illustrated, however, the book seems to run out of steam towards the end.Tis could be due to the fact that Shirer was forced to leave Germany before the entry of America into the war, but I believe it has more to do with the relentless momentum of events created by Hitler and his inner circle which began to collapse all around them, andthe puerile desperation of their final end game decisions which only hastened their demise rather than reclaim the momentum.In effect, the rooster they had created had come back home to roost, and they were caught in a web of their own making. I believe this is one of the landmark historical works of the twentieth century, alongside Shelby Foote's "Civil War," and Oswald Spengler's "Decline and Fall of the West. "That said, the book does have its flaws.Shirer seems to have an affinity for Homeric motifs, such as "Goering the corpulent Reichs Marshal,""Himmler, the mild-mannered chicken farmer," and so on.It is not clear why Shirer uses this device over and over again.Perhaps it ihe wished to remind us of Goering's greed and Himmler deceptive self-effacing nature while he plots your downfall.And it fails to address the real tragedy--the wreckage of those great European states that had dominated world history for over two centuries.Britain alone would emerge from the ashes but its empire of the Sun would be no more within a generation after the war.Britain no longer had the resources or the wherewithal to maintain its hold on it. I ordered this book and it arrived earlier than expected and in perfect condition.A great buy! Just a good Historical read. Simply enjoyed. Very detailed and technical, but just enough so on the technicality. I shall read again in a few years. This is the perfect introduction to Nazi Germany for those who, like me, are just beginning to study this disturbing and fascinating period of history. There are a number of things which I think make this the perfect introduction. First, Shirer was a journalist and an excellent writer. This is diplomatic history at it's best. Shirer does an excellent job of both presenting the big picture in terms of the overall narrative of events as well as the fascinating details which make a history like this truly engaging. This is easily one of the most readable and enjoyable history books I have ever read. Second, Shirer was actually present at many of the major events that he narrates. He was present in Vienna on the night of the Anschluss of Austria, he was present at the French surrender at Compiegne, and he was present during many of Hitler's speeches. He was in Berlin just before the outbreak of war and is able to describe the mood, and the tension, of that city and its inhabitants on the eve of war. This adds a vividness to Shirer's account which is unique. Third, despite what some negative reviewer's have claimed Shirer's scholarship was excellent. I have no doubt that scholarship on Nazi Germany has progressed a great deal since this book was published, and it will no doubt be possible to find errors here and there, as well as questionable interpretations. But one should always remember that fifty years from now people will be saying the same thing about the books that are being published today. Does that mean they should not be read? Of course not. The fact is Shirer quotes extensively from captured foreign documents, Nazi diaries and letters, speeches, as well as testimony from the Nuremberg trials. It would be hard, I think, to find a single unsubstantiated claim in the whole book. Shirer was not just a journalist writing down his personal reflections, he did his research, and it shows. I agree with some of the reviewers who have said this should not be the only book you read on Nazi Germany. But it would be impossible, in my opinion, to find a better place to start. I just finished this 1500 page masterpiece and was amazed at how good it was.It was a historical work so well written and original in its research that I was sad to turn the last page but grateful to Shirer for the incredible work he'd done. Shirer was a CBS news reporter in Berlin during the pre-war years during Hitler's meteoric rise and covered the appeasement of Nazi Germany by the Western democracies, revealing thru his research that the Nazis were fully aware that if they were called to task at any time they would have been roundly defeated militarily and finished politically.This was evident from the internal papers Shirer was given access to after the war. Shirer uncovered many other previously undiscovered facts about Nazi political interference in the Wehrmacht High Command that ensured Nazi defeat, such as Goering & Hitler's decision to "terror" bomb London in retaliation for a small British bombing raid on Berlin, which turned out to be a disasterous decision on Hitler's part, because the strategic bombing of England's manufacturing had nearly destroyed Britain's radar defenses and defense manufacturing capacity at the time of Hitler's decision to abandon strategic bombing for "terror" bombing. This is the tenth volume of Durant's Story of Civilization and his love for the great men and women of history shines through.My appreciation of history, philosophy and literature stems from reading these volumes.My reading list is heavily influenced by what is mentioned in this book. As is his custom, Durant focuses on those events and people in history that have influenced our civilization.This volume focuses on France, England, and Germany from 1756 to 1789 (the beginning of the French Revolution).He also touches on the rest of Europe from 1715 to 1789.As can be seen from the title, Rousseau is the focus, contrasted with Voltaire in his previous volume. This was the time of Rousseau, Voltaire, Kant, Haydn, Bach, Mozart, Casanova, Catherine the Great, Frederick, Goethe, Schiller, Boswell, Gibbon, Walpole, Samuel Johnson, and many other great figures in philosophy, music, literature, and politics.Durant did an excellent job showing how those figures impacted their time and still have an impact in our time. It is interesting to note that this was intended be the final volume of this work, but since Durant lived much longer that he expected, he and his wife did one more volume on the time of Napoleon.I am just starting that final volume. I highly recommend this book, and it should work well read alone, or as part of this series.This is great literature and teaches great lessons of history that I wish our current leadership would read. bought it to complete a set; i wish i would have paid attention to publication date cause now i have a mismatched set of different color covers. People "of a certain age" will remember when a certain book-each-monthclub offered a bonus to new members:LP's (yes, that long ago) of Beethoven's nine symphonies, a two-volume compact Oxford English Dictionary with magnifying lens, or the eleven-volume HISTORY OF CIVILIZATION by Will and Ariel Durant.I went for the OED, but fortunately, years later I glommed onto the Durants' wonderful set of histories, which chronologically track Asia and the Greco-Roman world up to the time of Napoleon using multiple but well-coordinated discussions of cultural, historical and intellectual histories. Will Durant was, philosophically, a culturally conservative man but not a reprehensible man.The very first volume of the full 11-volume set is OUR ORIENTAL HERITAGE, and other than the slightly quaint use of "oriental" to mean what we'd today style "Asian," his and Ariel's obvious appreciation and respect show through -- and tie us to later Europe. And while he wasn't a fan of "the proletariat," there are few histories that are so considerate of the reader and lack both cant and obscurity.Sometimes hard to find in these deconstructed times! I don't expect those who read this "rave" will want to go out and invest in the full set, but start with any volume -- particularly ROUSSEAU AND REVOLUTION -- and if you enjoy the approach and the multiple takes on history, you'll probably want more.Not to scare you but I don't believe bomc is printing these any more; good used or new copies will make for great knowledge and good keepsakes too.I also understand that of late a "collectors" type book club offers the entire set all together.But unless you like the smell of slurried leather covers and don't mind paying a much steeper price, probably better to go with good used volumes through Amazon. ...continues the excellence of the series. Originally intended as the final book of the series, "The Story of Civilization", in ended up being the penultimate volume. The Durants lucidly and eloquently summarize the philosophy, life and influence that Rousseau had on the 18th century and, indeed, continues to have to this very day. 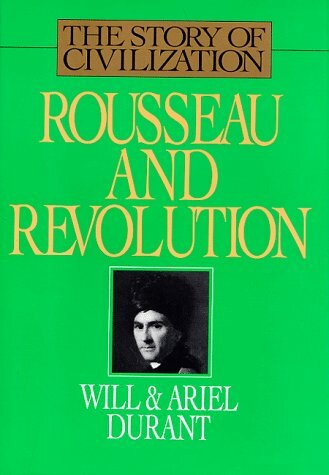 Rousseau may be regarded as the creator of the Left-wing sensibility. This may seem anachronistic and, in a sense, it is. Rousseau died before the French Revolution, which created the modern political division of Right and Left. Nevertheless, it is accurate to see him as the Fountainhead for relativism, communism, and the worship of feeling as opposed to reason (debased and emptied of all intellectual content this is now called building "self-esteem" by the modern leftist). Rousseau created most of the modern ills of political fanaticism and airy, absurd idealism as the Durants so ably note. The rest of the period is not neglected and vivid portraits are made of Frederick the Great, Catherine the Great, the Elder Pitt, Diderot, D'Holbach, Samuel Johnson and many, many others help this book to shine. Awarded the Pulitzer Prize--which should have gone to the entire series as opposed to just this volume--this book gives the reader a complete (if necessarily synopsized) account of the End and Failure of the Enlightenment and how what Rousseau and Voltaire intended in their attacks on the social structure (Rousseau) and religion (Voltaire) lead to disastrous consequences in the French Revolution. The writing sparkles with vivid wit, pith and lucid beauty. It is a book to be read for a lifetime and bequeathed to children. In an age where smarmy, intellectually empty, political fanaticism is attempting to erase the past in favor of the PC fantasies of the moment, the Durants offer a vivid account of the Truth. European civilization is presented here in all its glory and with all its warts. Slavery, religious fanaticism, exploitation and the horrors of the penal system and warfare are all presented here, in their proper place and in context. The modern academic community has attempted to destroy the ideal of context and balance. As long as these books are around, REAL history and historiography are available to anyone who simply opens a copy and reads it. The Tenth Volume in The Story of Civilization! In this, the tenth volume in the critically acclaimed series "The Story of Civilization," Dr. will & Ariel Durant have compiled a masterful dramatic exploration of the European climate and the events which paved the way for the French Revolution. The reader will be exposed to a vivid recount of the acts of: Rousseau, who confessed his most embarassing sexual and emotional episodes.England and the rise of her overseas empire.Catherine The Great of Russia.Frederick The Great of Prussia.The German Enlightenment.Marie Antoinette.France's impotent and frustrated King Louis XVI.And much, much more including plates and maps. 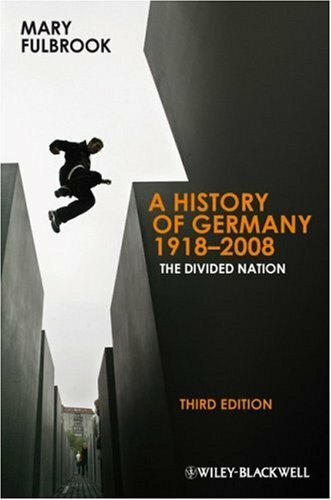 The third edition of A History of Germany traces the dramatic social, cultural, and political tensions in Germany since 1918. 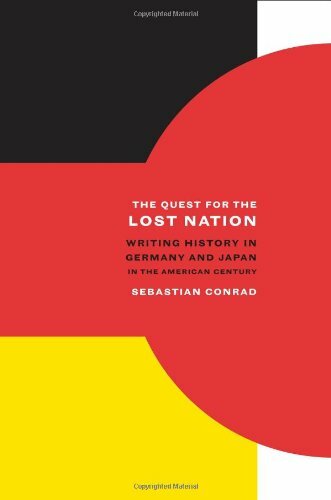 I was looking for one book that would give a good, clear account of Germany since World War I, particularly so as to understand the Germans and German culture today. This book is only recently published (2009), and thus, to my knowledge, is the most up-to-date. However I cannot say that the book is of the highest quality. I would like to give it 3.5 stars, but I'll have to settle for 3. 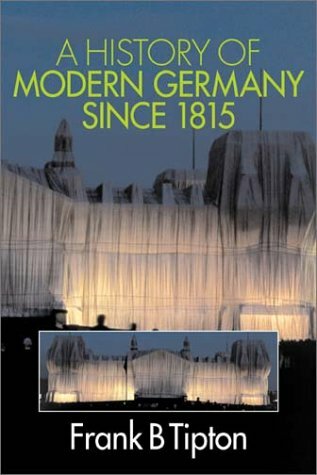 The book does give a decent overview of the main international and national events in German history over the last century. The focus is political, military, and economic. The book is strongest for earlier history (aftermath of WWI > WWII) than later. I appreciated the account of what ordinary Germans did and did not know about the Holocaust. As for weaknesses, first, it could have been edited much more tightly, for Fulbrook tends to be repetitive (not just at the beginning and end of chapters--as if to reinforce important material--but throughout the book). The book could be a third shorter. Along with this, one senses sometimes that the book is an amalgamation of sections intended for different audiences. Is it for general readers, university-level classes, professional historians interested in historiography? It could be for all, but the style is not uniform. For instance, chapter 12 ("Diverging Cultures and National Identities?") feels like it was originally a paper given for an academic conference, but which has not been integrated well into the book. When, in this chapter, Fulbrook asks, "Can one in fact speak at all of national political cultures" (p. 265), and proceeds to speak in generalities and not about German history, one feels that this is the real question of the chapter and as if one is being led on a tangent--interesting theoretically, but irrelevant to the task at hand. Given the book's tendency to focus on political-military-economic history, the presentation of German culture is weaker. If you're looking for an account of contemporary German culture, as I was, this book is not for you. A synthetic approach combining political, social, and ideological texts offers students a wide perspective on life in Hitler's Germany. Unit I considers the political history of Germany from 1918 to 1938; Unit II focuses upon National Socialist ideology and the dictatorship of 1938–1945; Unit III considers Nazi power in its police and military forms. Just as I was about to conclude that there is little else to be said about Hitler and Nazi Germany, then comes along this book. It is a part of the D.C. Heath's "Sources in Modern History Series." 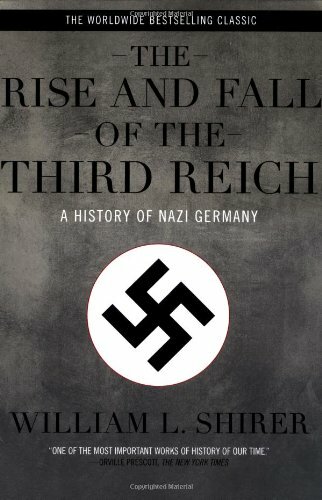 It is both a thoughtful and thought-provoking addition to the huge volume of literature on the Third Reich. 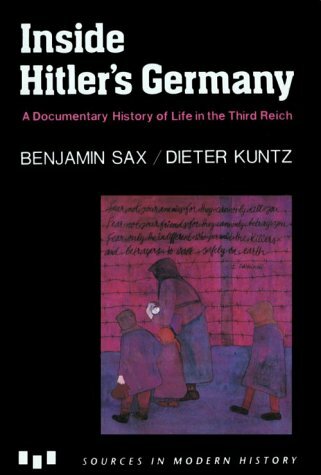 It draws on primary source documents and first hand accounts, and thus, as advertised, is a documentary history of life in the Third Reich during the Nazi's reign. The authors recognize that National Socialism is traditionally viewed from two opposing and very much contradictory perspectives: Either as a rejection of modernity and an aberration of European history, or, as the ultimate expression of this modernity andthe actual culmination of Western Civilization. The authors both of course remain agnostic on this debate that lies in the subtext to the book, preferring to allow the documents and first hand accounts speak to the readers, and for themselves in the hope that the reader will discover a yet broader perspective encompassed in the synthesis of political, social and ideological factors that the documents reveal. To carry out this task, they have organized the documents into three thematic units covering the phase of history from 1918 through 1945. 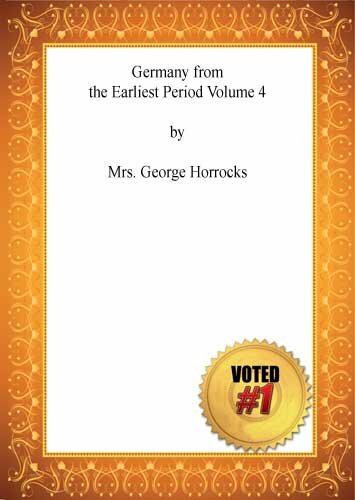 Phase one, deals with the background and political history of Germany from 1918 to 1938, covering in great detail the period Hitler took over the reigns of power. Phase two focuses on the National Socialist ideology and its creation of the "Volk community" with the aim of eliminating Jews from German society. The final phase discusses the essence of the regime: how power was realized and distributed throughout the German society by the police and the military. This division of the documents into these three very useful units has a lot to offer even to those of us who have delved into this history in depth many times and with many other authors. Not only is it an orderly way to organize a volume, but it lends a new kind of wholeness to the enterprises of political, societal, and ideological factors. It also makes for easier reading, ease of collating facts, easier to remember them and serves as a handy look-up and recall reference. There is a kind of natural symmetry in the author's phases, and the normal "hooks" for mental association. I find myself both quoting and going to this book first before consulting others on the Nazi phase of European history. I am very grateful for this handy book. 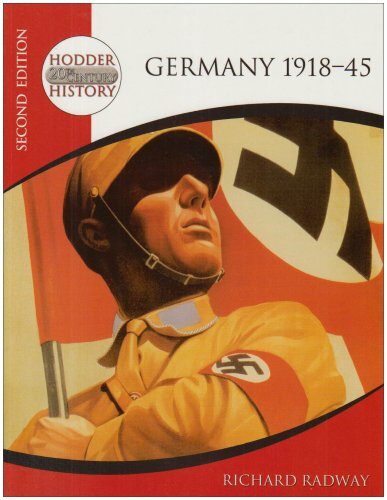 This book provides an excellent array of documents on Hitler's Germany and the rise of the third Reich.Germany has a checkered history but it's well represented through the documents chosen here. This is an ideal book for a college seminar on the Nazi's or anyone who wants to do research on the regime. I commend the authors for the comprehensive documentation but they missed an important historical point. There was no mention that Hitler was appointed after he apparently blackmailed the old man, Hindenberg. Most historians point out the fact that Hitler got wind that Hindenberg was given a large Junker estate in East Prussia. That in itself was not illegal but when the deed to the estate was made known it contained the name of Paul von Hindenberg's son as the owner (Oscar von Hindenberg) rather than the old man. This was an attempt to avoid the inheritance or death taxes that would become due on the death of the 85 year old pompus old man who was commander of the German Army in WW1. It was Paul von Hindenberg who was responsible for appointing Hitler(who had only 34% of the vote in Nov 1932) but/and until his death in August 1934 had the ability to remove Hitler but did not. It was Hindenberg who was blackmailed and further induced by an additional gift of 450,000 marks for which he failed to pay the taxes on plus an additional 5000 acres the Nazi's added to his estate after Jan 1933. In addition, the old man still had the clout to protect the life of a personal friend, Franz von Papen(a previous Chancellor) and he did that. I think the authors failed to provide the students at the U of Kansas the name of the real slime-ball responsible for Hitler--Paul von Hindenberg, the pompus coward President who appointed Hitler and who obviously felt and acted that his own person legacy was more important than the destiny of Germany!! !As an accurate historical document this book falls way short. In fifteenth-century Germany, women were singled out as witches for the first time in history; this book explores why. Sigrid Brauner examines the connections among three central developments in early modern Germany: a shift in gender roles for women; the rise of a new urban ideal of femininity; and the witch hunts that swept across Europe from 1435 to 1750. Mr DiNardo has done a nice job of summarizing Germany's evolutionary development of Germany's war doctrine with the panzer spearhead at its core. This development started in 1917 when the British dominated the battle field at Cambrai and elsewhere. The development continued into the 20s and 30s and right through WWII. While the Germans were aware of British theory being propagated during these post war years, much of German mobile doctrine was formulated internally by not only Guderain but also by Lutch, Tschischwitz, Heigl and Volckheim. The first chapter, "Equipment and Economy", which was the largest in the book and the most interesting, explains how a country's economy can impact the effectiveness of a resource intensive war doctrine having mobile warfare at its center. In German doctrine, mobile warfare meant not only panzers but also supporting trucks to allow infantry and artillery to move with and support the panzers as they drive to the rear of the enemy. Germany never had enough trucks and often had to use horses and captured vehicles to supplement their own. Among the key conditions necessary in successful development of an army, a country needs to have abundant natural resources ( high grade iron ore, oil, rubber etc), sufficient production capacity, coordination between competitive Armed Services and industries and a stable and efficient government. Your weapons also had to be at least equal or better than your enemy. The author clearly shows Germany didn't have any of the above requirements. Hitler and others were semi aware of these problems but couldn't institute the proper changes to effect major improvements. The small scale invasions of Poland and then France hid these shortcomings but it was almost immediately recognized when attacking a giant like Russia. Lack of oil and production capacity to stay up with battle casualties and inferior tanks would play a major role in Germany's defeat. There is so much more to this chapter and yet the author clearly lays out the arguments against Germany winning the war with these shortcomings. Not only was Germany short of panzers and trucks but they were also lacking sufficient officers and men to defeat the Allies. 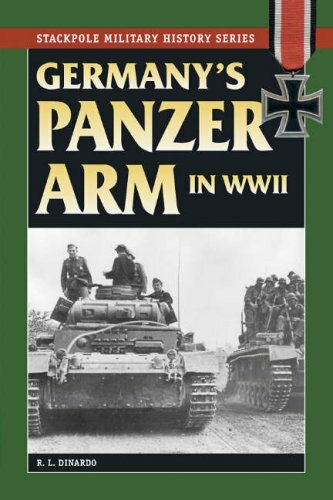 The next two chapters coverthe personal side of war where training and discipline is generally important but also more specifically where a coordinated discipline between the different units of a panzer division is critical. For example infantry, engineers and artillery units must seamlessly interface with the panzers while on the battlefield; its a mutually supporting team. It will also be shown that as the war with Russia dragged on and Germany kept losing their experienced officers that this discipline and coordination deteriorated, quickening their demise. Guderian and others spent much time in determining the ideal organization of a panzer division. The proper balance of mechanized infantry, engineers, artillery batteries were essential if a panzer division was to be victorious. The author not only describes this evolutionary process but also presents org charts of a panzer division for 1938, 1941 and 1944. The different charts show the many changes as doctrine improved in the early years as well as the changes that were necessary to reflect the deteriorating conditions in the last couple years of the war. There is an extensive Notes Section and Bibliography if further reading is desired. There is also a nice photo gallery. While there is no battle history presented, the author brings out some key points to German development of Blitzkrieg and the internal reasons that played heavily on why Germany lost the war. If you have an interest in mobile doctrine and divisional organization that not only applies to Germany during the war but could also be applied to other countries and different times, this would be a good read. If only Rommel had been the leader in Germany, history would have been so different. 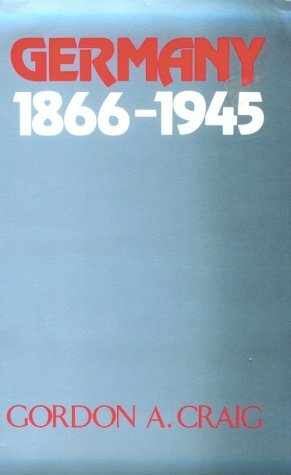 Contrário à maioria dos livros sobre o assunto, mais pontualmente sobre as divisões blindadas alemãs (panzer) durante a 2ª Guerra Mundial, este livro de Dinardo é na realidade a sua dissertação que trata sobre esta parte do exército alemão. O que torna impressionante é a sua metodologia de pesquisa a qual se baseia em um infindável número de fontes corretamente exposto ao final do livro na referência bibliográfica . Sendo assim, vários pontos são abordados de uma forma estrita de pesquisa que, se por um lado pode parecer um tanto enfadonha, por outro promove o exame de vários aspectos até então considerados como pura verdade por outros autores. Estranho que o próprio livro parece ser menor do que uma boa dissertação, mas isso não impede o seu caráter explicativo e, mais ainda, elucidadtivo.Para se ter um exemplo, a própria afirmação do autor de que as teorias de Guderian sobre o emprego dos panzer não eram totalmente advindas de Liddle-Hart, Fulller e DeGaule (como é apregoado por um bom número de autores) serve para lançar uma nova luz sobre o assunto. De qualquer maneira, recomendo este livro para os aficcionados pelo assunto, principalmente pelo seu caráter histórico.Não é uma obra que sirva para referência de plastimodelistas uma vez que o número de fotos é bem baixo.Mas serve como um bom mapeamento sobre o assunto que é, às vezes, errôneamente tratado pelos "historiadores de plantão" os quais, baseados em fontes não tão confiáveis, fazem afirmações vazias e sem provas. 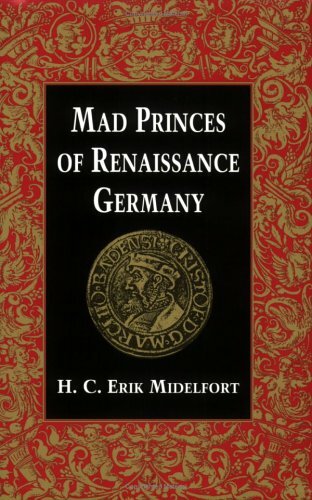 During the sixteenth century close to thirty German dukes, landgraves, and counts, plus one Holy Roman emperor, were known as mad- so mentally disordered that serious steps had to be taken to remove them from office or to obtain medical care for them. This book is the first study these princes, and a few princesses, as a group in context. The result is a flood of new light on the history of Renaissance medicine and of psychiatry, on German politics and in the century of Reformation, and on the shifting Renaissance definitions of madness. The piece de resistance of this book has to be the theological memorandum concerning the mental condition of the Duke of Prussia which begins with the unfortunate Osiandrian sympathies displayed by his parents prior to his birth and their possible contribution to the current situation.The majority of the recommendations, however, came from physicians and were medical rather than theological. It's solidly researched -- if anything, one would have wished more detail on some of the episodes, such as that of the Duke of Saxe-Weimar in the bath house. This is the book that inspired me for starting my Mad Monarchs Series (http://www.xs4all.nl/~kvenjb/madmon.htm)! Before I found this book, I had often seen references to "the last mad Duke of Cleves, married to a sister of the last mad Duke of Prussia". This book has finally shed some light on that odd pair of Dukes. The first part of the book focuses on the early 16th century, when mental problems was not regarded as an illness and melancholic Princes were locked up and often neglected. Sometimes they were exorcised. The cases described are, among others, Princes of Hesse, Saxony andBaden. William the Younger of Brunswick is the 1st Prince whose mental state is described in more detail, because unique reports have survived: "He ran out into the streets of Celle half-dressed, [..] spoke unintelligibly and gestured weirdly". He was actually treated by doctors. The second part of the book describes Albrecht Friedrich of Prussia, Rudolf II of Austria and the last Dukes of Cleves in more detail. Midelfort describes detailed accounts of their mental and medical conditions and the doctor's crude attempts to cure them. The book is a serious and detailed study of 16th century Princes that were described by their contemporaries as "melancholic" or locked up as being "mad". Black and white images of most of the described mad Princes and Princesses are included. An unique book about an unique subject! Although the title initially almost seems like a parody of historical research on incredibly arcane topics (and, as Midelfort points out, there is no particular reasons to believe that Renaissance German royalty weremore prone to insanity than anyone else, inbreeding not withstanding), thebook in fact uses the unusually high levels of documentation available onthese individuals to create a fascinating and detailed study, not only ofthe medical and religious treatment of insanity during this period, butalso of the political implications when a monarch or his heir became"unfit" to rule. on missions, is new information to me. There are many books on this subject, but they often become overloaded with dry statistics and remote strategic reasonings. This author flew the missions and lived the terror, seeing his training camp comrades killed one by one, even 10 at a time. Death does not refrain from visiting his crew either, as his tail gunner dies in a hail of shot. The author describes how he and others become dependent on drugs and alcohol to keep going, of how the odds against survival are so high that the only way to cope with it is to reckon yourself as already dead. Against all reasoning he finds romance in London, and he and his lover despairingly count down the remaining missions only to have the bar raised 20% by higher command. He lives, but at a high price for himself and his comrades. It is a moving narrative, one which takes you right into the bomber's agonising ordeals. 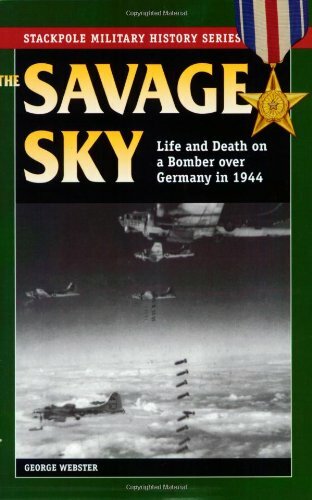 This book written by Dr George Webster, PhD (Biochemistry) about my father's Boeing B-17G bomber crew; one of the most depressing books I have ever read! ...83% casualty rate in my father's squadron during the time he was flying out of England in early-mid 1944 (with a 40% casualty rate on one combat mission alone). A chilling read. I now realise that I am REAL lucky just to be here! Clearly my dad (a bombardier) wasn't embellishing those combat mission (horror) stories he told me when I was a kid after all.Hauntingly for me, this book reads as if I was listening to my father recount each bloody mission. My father said that he was so scared before each mission that often he would upchuck his breakfast before climbing aboard the bomber. Highly recommended for those who can deal with such intense tragedy.. I can't add much to the other reviews except I too want to know what happened to Jane. Webster's story is both honest and hard to believe. A kid, lost in a war, lost in London, and waiting to die while learning to love. Did they really fly to 30,000 feet with an open roof and wind blowing in at 170 mph in the radio compartment at 50 below and nothing to keep them warm but an electric still suit? Each time they flew they had about a 6% chance of getting killed. That gave them about what, a 20% chance of surviving all 25 missions? In other words 4 out of 5 kids were going to get shot down, one way or the other, usually in a ball of fire. Until the limit got extended to 30. George Webster manages to capture his own innocence and wonder and terror and traumatic stress and first love, even while looking back through a long life and successful professional post war career with wife and kids. I imagine his kids and grand-kids are more than grateful for his telling of this story. Is it really true? Wow. Ehh...maybe 3.5 stars is more like it. 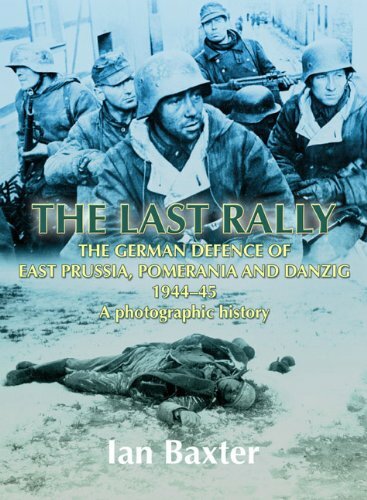 This book is marketed as a sequel to BATTLE IN THE BALTICS 1944-45: The Fighting for Latvia, Lithuania and Estonia, a Photographic History and chronicles the German defense of the East/West Prussia, Pomerania, and the port of Danzig. In short, this is not a bad book. But like its predecessor it could have been much better. The photos are good and of pretty good quality but as another reviewer noted, there is not a lot of variety...artillery shots (no pun intended) are in abundance. A couple of photos are presented twice from different angles..not exactly sure why as the change in perspective doesn't add much. The book goes beyond Battle in the Baltics by providing more maps..a real plus for providing context..but falls short on narrative text. Yes, this is a "photographic history" so the pictures should do the talking, but I was struck by a lack of any real treatment of Soviet atrocities or photos of same. For example, Nemmersdorf is mentioned only as a city in two photo captions of the same destroyed T-34..and that's it. Maybe Baxter is trying to be impartial as there still exisits some controversy about the Nemmersdorf atrocities, but I found the omission odd given that this book is presented from the German perspective and the depth to which other authors have described the brutality of the Soviet advance. At the risk of being repetitive, I am also forced to make the same criticism I made for Battle in the Baltics...the lack of any photos taken from the Soviet side. I think the addition of such photos would have offered a more well-rounded perspective of the hardships faced by both sides. I have a number of Ian Baxter's books, namely "Into the Abyss", "Battle in the Baltics" and "Steel Bulwark" in my book shelf which are very good. The books marketed as a photographic history or photo album have in the past produced a number of new photos that I have not seen before as is the case with this one. This recent offering however is a little disappointing, and falls far short of the excellent Endkampf : um das Reichsgebiet 1944/45 which also covers this same period in the conflict and is the bench mark for this type of book. There are very few armour photos, but If you are interested in images of Artillery pieces and postions, or mortar crews/pits or flak guns then this is for you as there is ample photographs of these types of scenes. However one finds these photos a little more tedious as you turn each page and there are yet more of the same. Granted there are some gems in there such as the two T34/85 that have been captured and are being used by German crews, but the picture of a German Armoured train,the Port at Pillau, and the award ceremony in front of a Tiger II I had already seen in Endkampf. The photos are clear but would have been better printed on glossy paper for better reproduction such as the JJ Fedorowicz albums. There is the ususal brief overview at the front of the sections to explain the battle situation as to where the photos were taken from which is quite useful, as are the maps provided. All in all though in my humble opinion, not his best. Craig assumes basic literacy in the overall history of Europe in the period he covers; this is not a good First Book of Modern Germany.But his coverage and analysis are first-rate.He covers foreign and domestic policy, as you'd expect, but also the culture of Germany before and after the Great War (tho with an understandable leaning to political implications). Craig sees a continuity in German ends, if not means, from Bismarck through to Hitler, and is withering in his criticisms of the German passion for "pounding the table" as a substitute for politics or, indeed, thought.His book doesn't completely explain the mystery of how the Germans could follow Hitler, but it made that clearer for me than it was before I read it.As we might expect of a professor, his analysis of German academic culture & its subservience to authority is especially good. I use Professor Turk's History of Germany in the first of three terms in my high school class on the Holocaust. It provides a good, quick overview of the subject. As such, it suits my purposes, but there are quite a few instances in which improvement is needed, and, in some cases, the facts are simply wrong. The first chapter, an attempt to provide important statistical information about Germany today (1998), of course soon becomes out of date. Were the book periodically reissued, this could be corrected. The errors or oversimplifications I have alluded to could also be rather easily fixed. Another problem with the book is that most of it deals with the nineteenth and twentieth centuries, giving the earlier history something of a short shrift. This is epecially true in the book's treatment (or lack thereof!) of the great Protestant Reformation. I have contacted the publisher about this, but they have sold the rights. Unfortunately, it is unlikely the book will be reissued. Despite its flaws it still does a good job of covering the subject in one concise volume. If anyone is interested in the corrections I have made, I would be happy to provide them. 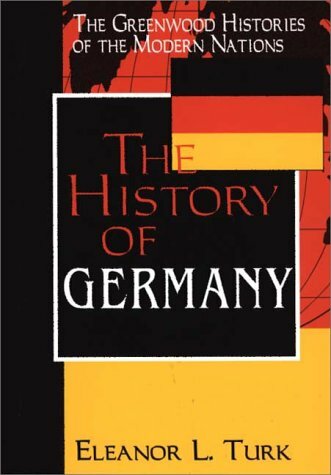 The History of Germany by Eleanor Turk is a well-organized, comprehensive, and academic narrative of German history; yet it is highly readable.The book is written in a way that creates academic interest and providesanswers to questions that college and high school students, as well asgeneral readers, have had about Germany's past and have wantedclarified. 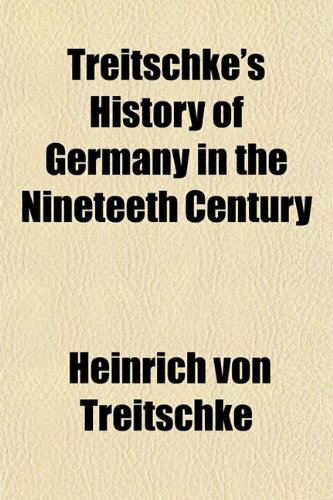 Beginning with a timeline and chronologically tracing distinctevents, the author first focuses on modern Germany in order to establish inthe reader's mind a full understanding of Germany's status--its problemsand successes--today.Readers are then taken back to antiquity and themiddle ages while being given the opportunity to examine each subsequentperiod of German history with its unique problems and to visualize howvarious crises within each period impacted Germany's future.Especiallyhelpful is a chapter centering on notable people who have played importantroles in the history of Germany. 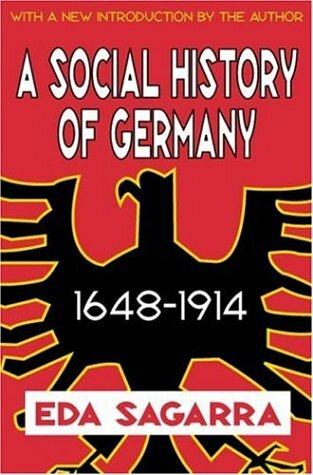 Dr. Turk has the unique ability ofmaking the pieces of the puzzle fall into place until the present realityof Germany and its future potential come into view.As one college studentobserved, "This is not a stuffy textbook.It reads like anovel." Shaman of Oberstdorf tells the fascinating story of a sixteenth-century mountain village caught in a panic of its own making. Four hundred years ago the Bavarian alpine town of Oberstdorf, surrounded by the towering peaks of the Vorarlberg, was awash in legends and rumors of prophets and healers, of spirits and specters, of witches and soothsayers. 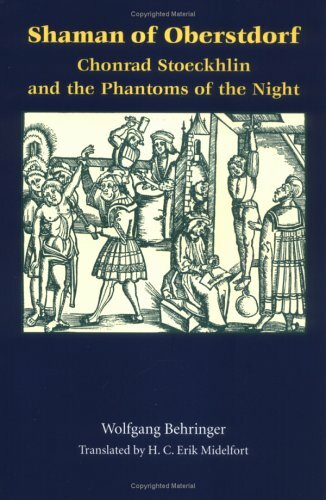 The book focuses on the life of a horse wrangler named Chonrad Stoeckhlin [1549-1587], whose extraordinary visions of the afterlife and enthusiastic practice of the occult eventually led to his death--and to the death of a number of village women--for crimes of witchcraft. In addition to recounting Stoeckhlin's tale, this book examines the larger world of alpine myths concerning ghosts and other spirits of the night, documenting how these myths have been abused by German political movements over the years. As an introduction to modern German witchcraft research, as a study of the local impact of the Counter Reformation, and as a historical investigation into popular culture, Behringer's book has the advantage of telling a compelling individual story amidst larger discussions of peasant raptures, magical healing, and unfamiliar alpine notions such as the "furious army," the "wild hunt," popular bonfire festivals, and eerie echoes of pagan Wotan. Wolfgang Behringer is one fo the premier historians of German witchcraft, not only because of his mastery of the subject at the regional level, but because he also writes movingly, forcefully, and with an eye for the telling anecdote. Reminiscent of such classics asThe Cheese and the Worms andThe Return of Martin Guerre,Shaman of Oberstdorf is an unforgettable look at early modern German folklore and culture. Chonrad Stoeckhlin, a stall boy (and the main character of this book), made an agreement with his good friend, the oxherd Jacob Walch, in 1578. According to this agreement, he who died first would return to tell about life in the hereafter. And no more than a few days after the pact was agreed upon, Jacob suddenly died. He kept to his word with his friend though and appeared before Chonrad five whole times. Since I have no intentions to ruin the reader's experience, I will not divulge what Jacob had to tell about life in the hereafter or how Chonrad reacted to what he heard. But after some years the judicial authorities took notice of the stall boy's strange and suspicious tales about contacts with the other world. And in 1587 the stall boy from the Bavarian alpine town of Oberstdorf was executed for witchcraft. Stoeckhlin had to answer 146 various questions during the legal proceedings. Based upon the profuse 1586 sources, the German historian expands his story to delve into topics such as fortune telling, shamanism, witch sabbaths, and the interplay between popular and learned culture. This is a fascinating book, even though Behringer occasionally has a tendency to waver some distance from Chonrad's story. But, certainly, the stall boy story from Oberstdorf is fascinating reading and a work of eminent scholarship. Germany has fascinated its own people as well as onlookers in the twentieth century because, unlike the history of other European states, its very being has been posed as a question. Why was there no unified German state until late in the nineteenth century? How did Germany become an industrial power? What responsibility does Germany bear for the two world wars? 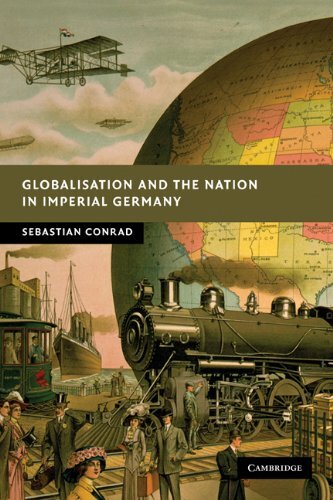 This accessible but authoritative study attempts to answer these and other fundamental questions by looking at the economic, social, political and cultural forces that have created modern Germany.